Wrap herbs and spices in a small piece of cheesecloth and secure with kitchen twine. Place beef, vegetables, and sachet in large soup pot. Add enough cold water to completely submerge meat and vegetables. Bring to a boil, skimming any foam that rises to the surface. Turn the heat down to a simmer and cook until meat is very tender when pierced with a fork, 3-4 hours. (Add more water if necessary to keep meat completely submerged) Let meat cool in the broth. Remove the meat and strain the broth. Preheat a large skillet or griddle on medium-low heat. Lightly butter one side of bread slices. Spread non-buttered sides with Russian dressing. 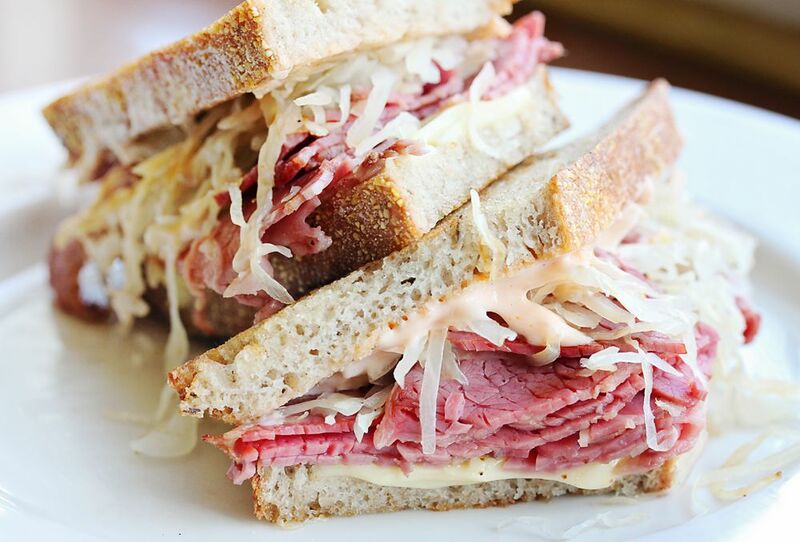 On one of the slices with Russian dressing, layer the cheese, corned beef and sauerkraut. Top with remaining bread slice, buttered side out. Grill sandwich until both sides are golden brown, about 10 minutes per side. Serve immediately.